Hopefully you still have some Halloween candy left over. This fun little food craft will help you use up some of those candy corns that no one really likes to eat anyway. 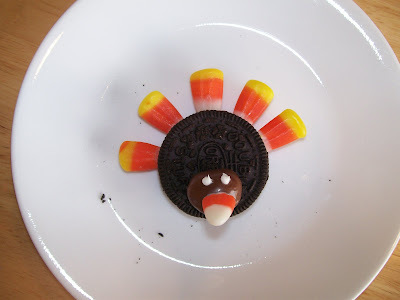 Use an Oreo for the body and wedge candy corns in between the two cookie pieces for your feathers. For the face you can use a Whopper or Milk Dud. I used a small amount of frosting to help the Milk Dud stick to the Oreo and I also used the frosting for eyes and to stick the "beak" onto the turkey's face. Way cute and I might just have to use it for our preschool snack this week! Thanks ladies! So cute! And easy too! Cute and easy is always up my ally :). We will try these!